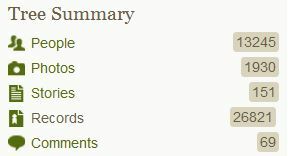 I’ve been so busy with work projects that I haven’t been blogging very much, so I particularly appreciate Amy Coffin of We Tree offering blogging prompts. This week she suggests we write about our blogging software. I almost didn’t write about this because I’m not the primary researcher in my family’s genealogy work – my daughter, Kay, is (you can see her research at her website or her blog) Since Kay maintains the genealogy program it isn’t important that I have one; however, I frequently have questions about someone and Kay is not always immediately available to answer my questions until she’s home and has time to open her program. One day when we were on a research trip, I asked if it were possible for me to have the information from her program in a format I could view. She told me about GEDCOMs and mentioned the possibility of free or inexpensive programs and we were off to search the Internet to find a good program for me. We selected Legacy 7.0 to try out because, with Kay’s experience, she could tell it had most of the functions she enjoyed with her program and because it has a free version (and not just for a trial period). I’ve been using the free Legacy version for about nine months now and have been very happy with it. There are some searches that aren’t available in the free version, such as the Descendant and Chronology views and there have been times I’ve thought of upgrading, but so far have not chosen to do so. My sister-in-law is just starting to do genealogy research and I suggested she download the free version to record her discoveries; so far, she doesn’t have enough information to justify much expenditure of money and this gives her a really excellent program to begin to record what she does know. Another good thing is that we can prepare a GEDCOM of her husband’s (my brother) side of the family so she won’t have to recreate the wheel in terms of all that data (very thorough, complete, documented research done by my daughter) – all she will have to add is what information she uncovers regarding her own line. Although it’s good to know from many seasoned genealogical researchers that Legacy is a program they use and highly recommend, I am happy to be able to tell the beginning researcher, those on low or fixed incomes, and those who don’t know if they’ll ever have enough information to justify the expense of a program, that Legacy 7.0 is free and if you decide you want to upgrade to the deluxe program, the cost is $29.95 (in other words, you don’t have to mortgage the family farm to purchase it).